The club uses a state of the art electronic court booking system, which can be accessed in the club or online through the internet using a secure log in. Both the online and in club systems are easy to use, but please don't hesitate to ask another member if anything is unclear. At present you can use £1 and £2 coins to keep you system account in credit. Once your balance drops too low you will not be able to book or pay for courts until you top it up. The club secretary can credit player's accounts if cheques are posted to him (please note there is a minimum amount of £30 to be credited, cheques should be made payable to Ferriby Hall Squash Club. Bank transfers can also be arranged just speak to the Club Secratery. Every member has a personal account. This must be in credit in order to book a court. To credit your account in the club you need to sign into the console in the club using your ID key fob and then feed the unit with £1 or £2 coins. No other coins are accepted. Courts 1 and 2 start at the same time as each other, every 40 minutes. Court 3 runs with a 20 minute offset. The lights do not turn off between back to back bookings. The court-side timers and the displays on the court controllers indicate when time is up. The main console also displays the used and remaining time for all courts. 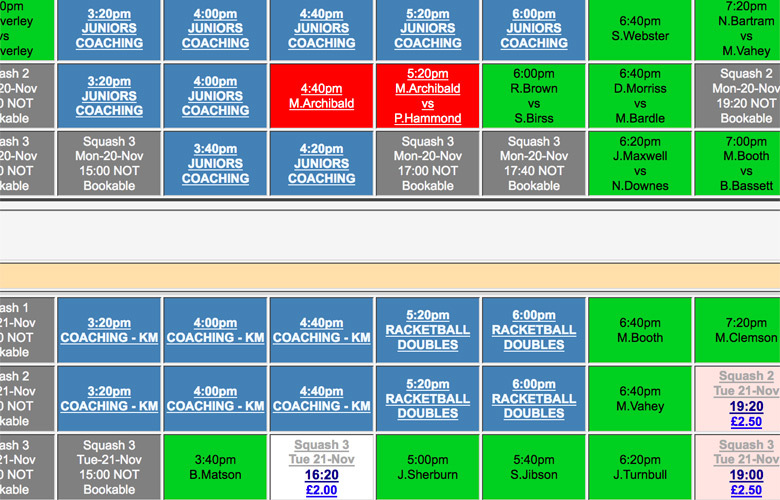 Peak court times will be from 5.20pm until the end of the day, every day. All members pay the same for court use - £4.50 for off peak and £5.50 for peak courts - which includes the booking fee and the lights. For pre-booked courts 50% is paid when booking the court and the balance is paid when the second player activates the lights using their fob. Activating a court that has not been pre-booked usually requires 2 fob activations; generally one from each player, although there is nothing to stop one fob paying for the lights in their entirety. Double Fobbing will attract an additional fee of £5 on top of the normal court fee. All courts are simultaneously released at midnight on a 14 day rolling basis. Each day, a further days courts will be available for booking (two weeks in the future). Members can book courts up to 2 weeks in the future. Courts do not have to be pre-booked, if a court is free when you're at the club you can activate it there and then until the completion of the next 40 minute cycle. Small control boxes equipped with a fob reader and an LCD display are installed outside every court, offering members a series of courtside features. 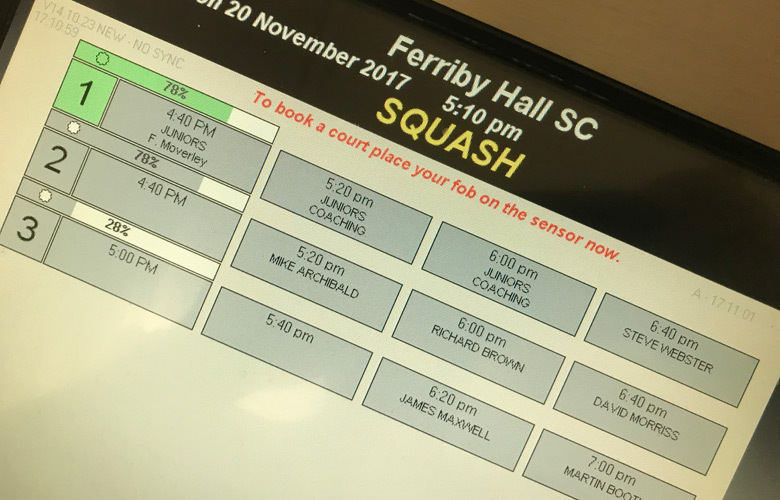 If a court is booked, the LCD display shows the name of the person that has booked it plus the time left for that session. The name of the second person appears when his/her fob is used to activate the lights. Split Fee Option – This feature allows the court cost to be shared by both players. One member will book the court and pay for half of the court cost in advance. The second player activates the court lights at the time of play by placing his/her fob onto the court side controller. One of the two players must do this or the lights will not turn on. Extensions - The courtside controllers permit players to extend their game, if the court has not already been booked by someone else, by placing their fob on the fob reader. The lights stay on for an extra 10 minutes and the member is debited a 25% court fee for the extension (pro rata if there are less than 10 available minutes remaining). You should hold the fob on the reader until the display confirms that the fob has been accepted. If you hold it on for longer, you may be charged for two or more extensions. It works best if you make sure the fob is pressing the edge ridge when you press it to the sensor. If you wish to have more than one extension, take your fob off the reader after the first payment, and then repeat the process.